“Urban legend” ….perhaps but absolutely true and the real figure was around £1 million. BA themselves provided this to thousands of staff at daily staff briefings which took ace for almost 2 years prior to to the move to t5. Concorde room is ok as you say it does not leave you with any wow factor. Pretty much like First on BA as a whole. It’s really no more than a solid business class offer. We LOVED BA First. Wouldn’t fly anything else these days if flying BA. As you mentioned it isn’t that great, which First would you recommend as a “not to be missed”. Ditto business actually. Would love to know which is the “best”. (We travel as a couple for leisure). 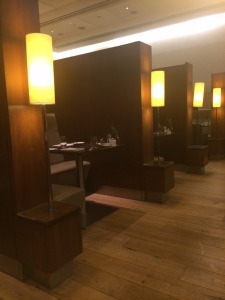 As you are referring to the flight/cabin then a good start would be looking at the Skytrax ratings, BA don’t make it into the top 10 for their cabins, although are ranked 7th for their First class lounge. I have never flown in BA Biz or First, but have with Emirates, Cathay, MAS and Virgin and frankly when I look at the BA product I wonder what they were thinking. The BA First seat looks the same as the CX or new AA seats in business (but with nicer lighting). If you were flying east then seriously consider Emirates, Qatar, Cathay (or even Malaysian First Class on A380), depending on the time of booking they can be better value than BA, especially if you factor in the Emirates chauffeur service which saves on airport parking/taxis. Re your comment about direct boarding from the lounge, BA’s Gate 24 lounge at LCY does that for the CWLCY service to JFK – if a short walk across the tarmac counts. The Emirates a380 version really does make you feel like you are on a different plane to those unseen souls trapped in the steerage pens below. At LHR the Qatar A319 service to Doha comes next closest they have secured the gate right next to the lounge entrance so you walk out of the lounge and down the ramp to the plane. I will be doing my “First First ” ( something I never dreamed of could happen, and its only a result of taking on-board the great advice from this site – thank you ) next year and I plan to visit the Concorde room and Galleries First, and sample anything and everything on offer ! I particularly like the sound of the champagne bar ! I am really looking forward to it, only having ever been travelled economy, except for an ungrade to CW a couple of years ago on a night flight and a CE trip this year. Do you know how far in advance you can book the Spa treatment ? 30 days is the earliest you can book spa treatments; I’ve got my first Concorde lounge visit planned for 28th oct! Note that booking in advance is only available at T5 departures and not at JFK or T5 arrivals. 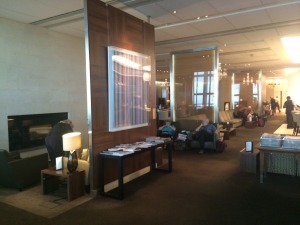 Your photos are particular poor and do not really reflect the lounge at all, which is a significant step up (for me) over the Gold First lounge, in both service and more importantly ambiance. It seems somewhat more care and effort was taken over your previous lounge review photos, such as the similarly low light affected Plaza lounge, which suggests you were trying to create a certain narrative here, especially when large areas of the LH FCT are not exactly blessed with natural light! It was 7am on a not particularly bright morning when I took the pictures! I think Plaza Premium did purposely go for an Asian style darkened look. The furniture and fittings in CCR do not give the impression of being chosen to fit in with a dark look – no cosy corners etc. At 7am I couldn’t have cared less what it was! Agree with Raffles.. Comfortable lounge but nothing more. As for the champagne on offer, really ? You want better, then be prepared to pay a higher price.. What they have is fine ! Remember that any review of ANYTHING is simply a personal perspective. Different people (at different times!) will focus on different things. I don’t think we can expect Raffles’ review to cover every single aspect of a particular lounge – I would hope that people use it simply to HELP them get an idea of what it is like. Nothing has changed, LPGS has never been regularly available in GF. We’re always dissapointed with Concorde – staff are terrible (I’d heard they used semi-retired crew, but this doesnt appear to be the case), food average and whenever we travel (usually to Tokyo) its packed full of people that makes getting a seat difficult. Cabana’s OK but not amazing. The whole room needs an upgrade to clean the carpets/furnature of stains and replace sofas that are marked. +1. The lounge is okay, the food is okay and the drinks aren’t anything I wouldn’t have at home. I think a refurbishment would make a big difference, but it’ll still be behind other first lounges for the dining experience. We were in the Concorde room in jfk last week. It was perfectly comfortable and did feel a bit of a treat when we sat down to dinner, but it was still a bit underwhelming. I really was expecting something incredible- I guess my expectations of how the ‘ other half’ live is is unrealistic. One thing that was very disappointing was the treatments. My wife was super excited about this and called up 3 weeks before to book in, only to be told that she could not book in advance. She was also told she was allowed only one treatment. As it happens we got to the airport very early thanks to a lunatic taxi driver and she was able to book in for a 15 min massage (the spa is in the other lounge), but I would have been upset if she had not been able to get in. All in all, a bit of a disappointment really but still far better than the laughably crap first lounge in Gatwick. 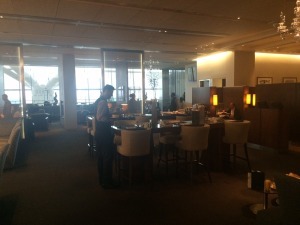 The most impressive ba lounge on my trip was the arrivals lounge at Heathrow! Agreed – my wife and I got treatments here recently. I had booked a massage which I discovered would involve sitting on one of those massage chairs where your face rests on some flimsy tissue paper which covers a circular pad where hundreds before have huffed and puffed (I appreciate many massage rooms use these chairs but I thought for some reason it might be different/lying down). I chose instead to have the automatic chair massage. My wife didn’t rate the facial treatment she got. The “other half” probably don’t bother to go to the CCR very often. Regarding your delay/no delay issue – you should invest in TripIt Pro. I fly regularly between LHR and TXL / FRA on BA, and I’m constantly getting notifications of delays (which are also advised at check-in), and then there is a subsequent “pulled in” notification from TripIt pro, indicating the delay has disappeared. Admittedly I don’t usually have to get to 5C, but as this is such a regular occurrence, I’d almost certainly be still sitting in a T5 restaurant while the flight has already taken off without the notifications. Problem here is that the flight was never officially delayed – it was still showing 9.40 when everyone was telling me it was now 10am! Rob, these notifications are not always ‘official’ delays, they are calculations based on the departure time of the inbound flight I believe. I really have the second what Henry says, the TripIt Pro service is beyond useful. 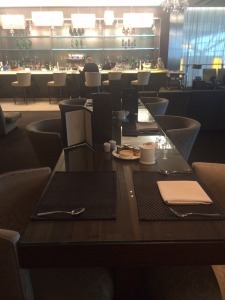 I used the Concorde Room at JFK over the summer and whilst the lounge itself lacked a wow factor, the very attentive service and amazing food, left me feeling very impressed. 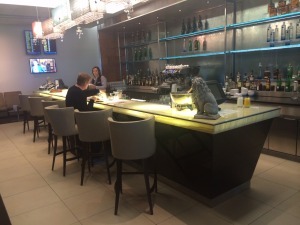 At JFK, with only a handful of flights and all going go the same destination, the lounge does have more of a private members club feel than at T5. I’ve been there a handful of times, most recently a fortnight ago. A perfectly pleasant space, probably the feature I most appreciate is the ability to bypass the shops, so you barely feel like you’re in an airport (until you need to get to your flight). Grand Siecle (which I think is excellent), good cocktails (espresso martini was very good), acceptable food (wouldn’t expect to pay much for it on the ground, but fine) and a relatively calm space – it’s a nice waiting room and much better than Galleries Club, but the ultimate in luxury it is not. And the jaded traveller in me is fine with that. Why are people so critical of Raffle’s (one person’s) opinion?? So, he sees it in a different way, and has different priorities… wouldn’t it be incredibly dull if we all saw everything the same way? We’re here to expand our knowledge and viewpoint, are we not? Give him a break… he does a great job! 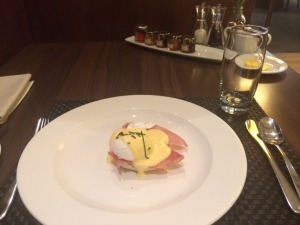 I am in the Qatar lounge in T4 next week so lets compare that one. CCR is still better than the combined Emirates business and First lounge, which is like a canteen, and the Star Alliance F lounge in T1 (now closing I assume). Not seen United First in T2. Was in UA F in T2 last week and took a couple of pics – will gladly send them over if you like.. Thanks. Happy to have a look (raffles at headforpoints.co.uk) and will put them in the photo album for the next time I cover T2 lounges. I’ll second that, everyone views thing with different perspectives based on experience. How anyone can criticise him, for offering his valued opinions, is beyond me. I personally think the Concorde room is great and that’s travelling with 2 young children, aged 5 & 6 the first time a couple of years ago. We were taking the 9.40pm to dubai and the staff were fantastic. The food was good airport food but not Gordon Ramsay quality, but I didn’t expect Gordon to have cooked it. The lounge was very quiet, we were the only ones on the terrace. Pretty perfect IMO. 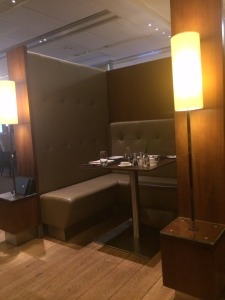 I last visited the Concorde Lounge two weeks ago. I personally do not like the “gentleman’s” club decor or atmosphere of the Lounge, it’s all very stuffy. I always sit on the terrace area when visiting to get some light. 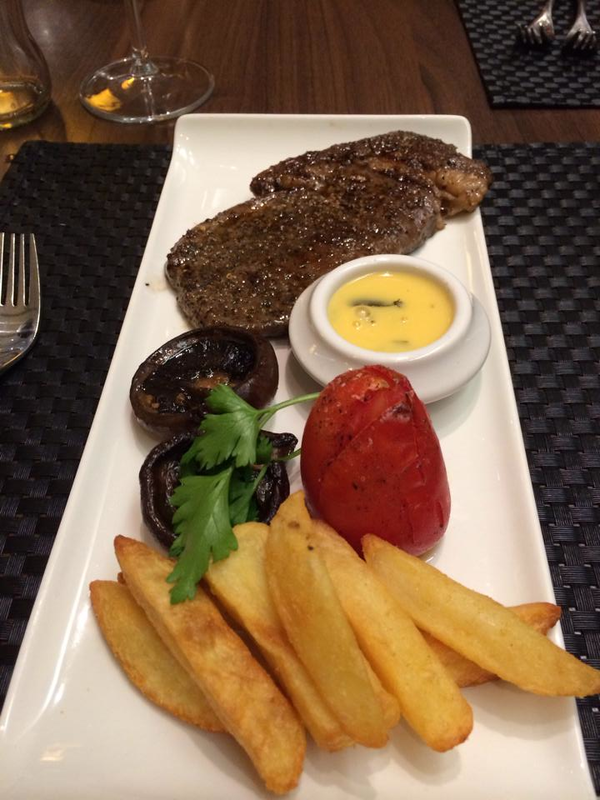 I find the dining to be a variable experience, I have yet to wowed by the service or food. On my last visit, I was waiting patiently at the head of the queue to be seated (dressed as a leisure traveller!! ), when the staff member returned he immediately served a just arrived suited gentleman without any enquiry as to who was next. The gentleman kindly demurred but the staff attitude to me reflected the less than welcoming and rather old fashioned atmosphere permeating the lounge. Using the Concorde Lounge is not a particular highlight of my first class experience and I fairly often hang out in the galleries lounge after sampling a couple of pink champagne’s in the Concorde Lounge. This sort of thing applies to BA as a whole, even in the economy cabin. So, would you say it might be better to just visit the first lounge instead? The last couple of times we have travelled our connections have been so tight we have been unable to use any of lounges, but next week we have a 3 hour connection so plenty of time. I also have a ‘first first’ in December. 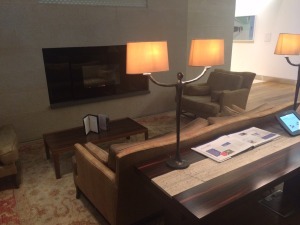 Can anyone tell me – is it possible to use the lounges on the return connection when I’m at LHR (going to MAN)? Yes, you just need to show your first boarding pass for the incoming flight to LHR at the CCR. Well… Almost every time I arrive in LHR on a BA flight in CE, connecting to GLA, I’ve been struggling to get into the Galleries lounge as staff don’t seem to know the rules for lounge access. I always did get in eventually (sometimes not before they had phoned their line manager…), but it really spoils the travel experience. Once, I asked for a written confirmation from BA beforehand, and I had that in my bag but of course did not need it on that occasion! Coming back in November, I’ll connect through LCY – no lounge, no nuisance! So does the serving of cocktails slow down the serving of champagne. I haven’t been to the CCR since the cocktails started. I abhor having to wait in bars for ages for a drink because someone ahead of me is ordering cocktails. Just wondering if on my next visit I can just ask for a bottle of champage to take to my table to save the wait? Not at 9 o’clock in the morning when I was last there! Although I sat at the bar to ensure no delays between rounds.